If you’re a diehard Zelda fan like I am, you probably know that the newest entry in The Legend of Zelda series, The Legend of Zelda: A Link Between Worlds, came out recently for Nintendo 3DS. You also might have ordered the Gold and Black Triforce special edition 3DS, paid for the overnight shipping, and screamed like a 90’s teen girl at an *NSync concert when the UPS guy finally brought it. Or not. But anyways, here is a roundup of wonderful Zelda projects posted on Craftster that you can appreciate whether you’re a fan of the series or have never played! But seriously, you need to play. 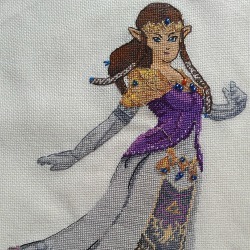 I adore this Princess Zelda Cross Stitch by Craftster member cthyllawakes. From the delicate colors of her gown, to the gold threads, and the careful placement of beads, I find this piece completely enchanting! Even Princess Zelda’s little side hair twisty things are rendered in loving detail! While Zelda might be the beauty (and the title character), Link is the guy holding the sword and the one the action is focused on! This Link Wall Hanging by Craftster member Emu is a truly lovely piece of art in the Wind Waker style. 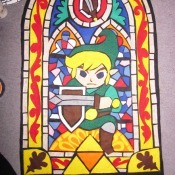 You can’t help but remember the stained glass images from that game when viewing this piece! This Hylian Sword backpack crocheted by Craftster Tutorial Contributor BunnieBard would be super practical for our fearless hero! Link could store his Boomarang, Bombs, Bow and Arrows, Hookshot, Fire Rod and myriad other items that help him adventure across Hyrule (and beyond!) right here in this backpack! The inclusion of a zipper on this crocheted piece is a technical feat that I must applaud! Majora’s Mask is one of the stranger Zelda games, what with it’s complete bending, fast forwarding, and rewinding of time and all, but that doesn’t mean that it’s not a great entry in the series! I think the sheer wackiness and terror of The Mask is captured perfectly here in ceramics by Craftster member KnittingKnerd. If you haven’t experienced this game but are intrigued to find out more about the origins of this Majora’s Mask Slab Container Lid, I urge you to check out the game! One of the ongoing gags in the Zelda franchise is the fact that if you hurt a cucco (Hyrulian chicken) too many times, a flock of cuccos will attack Link en masse and peck him to death. Ok, maybe it’s not such a good gag if you do it accidentally and haven’t saved recently, but what Zelda player hasn’t tormented these poor pixilated birds at one point? 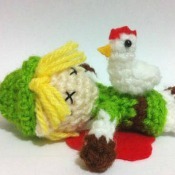 Anyhow, Craftster Tutorial Contributor amapoet teases out the humor in this Adorable Crocheted Dead Link Amigurumi. The little Xs for eyes, the pool of blood, and most importantly, the cucco sitting triumphantly on his chest all work together for a hilariously macabre tableau. For something a little sweeter, check out the post and see the second picture, which shows Link with a young Deku Tree. All together now: Awww! 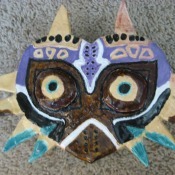 Ok, I could pick out another dozen or two dozen Zelda Crafts I love on Craftster, (really!) but it’s probably easier and more fun if you discover them on your own. 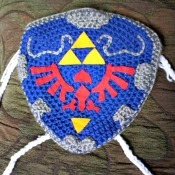 You can see more great crafts by viewing the Zelda tag.